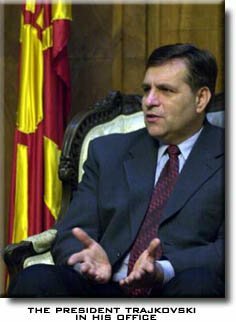 Boris Trajkovski (1956-2004) was inaugurated as a second president of the Republic of Macedonia on December 15th 1999, after the country had declared independence in 1991. His predecessor was Kiro Gligorov. Boris Trajkovski was born in Strumica, on August 25th 1956 (his origin is from the Monospitovo village in Strumica region). 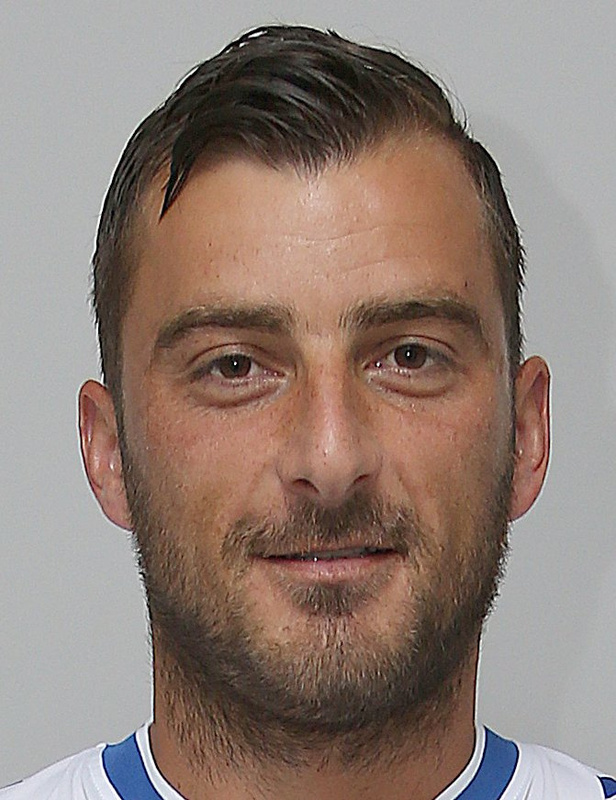 Boris Trajkovski was married to Vilma Trajkovska and is father of two children, a daughter Sara and a son Stefan. Boris Trajkovski has completed high-degree education at the Faculty of Law, in the University of "Sts. Cyril & Methodius" in Skopje, in 1980. Boris Trajkovski specialized in Commercial and Employment Law. Being a student he went on several study visits to the USA. Until 1997, Boris Trajkovski was the head of the Legal Department of the construction company "Sloboda" in Skopje. In the period 1997-1998, Boris Trajkovski was chief of Cabinet of the Mayor of the municipality of Kisela Voda in Skopje. On December 21st 1998, he is chosen for Deputy Minister of Foreign Affairs in the Government of Ljubco Georgievski. The political experience he used extremely good in the function of vice minister for foreign affairs. His work in the government consisted in establishing international contacts, with other governmental structures. During the Presidential elections in 1999, Boris Trajkovski was a candidate of the VMRO-DPMNE political party, lead by Ljubčo Georgievski. Boris Trajkovski was member of VMRO-DPMNE since 1992. In the period of 1992 to 1999 by work of the leader of the party, he leads the commission for foreign politic of VMRO-DPMNE. 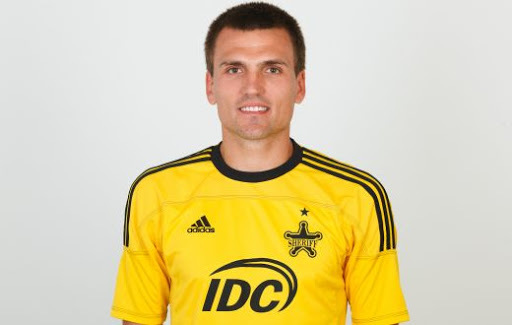 Boris Trajkovski had an excellent success in that work. From the year of 1993, he takes closer the political diplomacy between VMRO-DPMNE and the political parties in the USA and western Europe, and establishes contacts with leaders of political parties in Germany, France, Great Britain, Spain, Switzerland, Austria, Hungary and other countries. His work has improved the international rating of his political party. Boris Trajkovski has visited a lot of political and economical institutes, like: the national democracy institute, the Adam Smith institute, Westminster foundation of the democracy, Ezbery College and others. He was a former member of Presidency of the NGO: the Pan-European Movement for the Republic of Macedonia as well as of Macedonian-Croatian Society of friendship. Also he was former President of Church Council of the United Methodist Church. 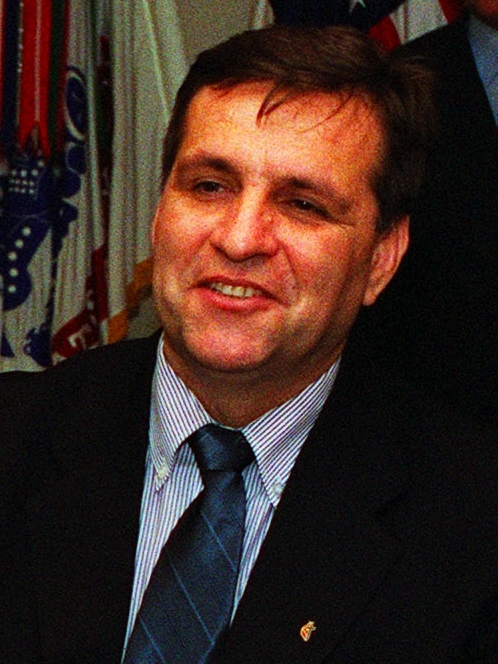 The President Trajkovski had won a nationwide approval as deputy foreign minister during the Kosovo crisis in 1999, during the influx of 300,000 ethnic Albanian refugees, from the Serbian province of Kosovo. In 1999, Boris Trajkovski called on the international community to immediately help Macedonia to better tackle the refugee crisis and relief this country of such burden. The President Boris Trajkovski had won praise abroad for cutting a deal with ethnic Albanians during the 2001 conflict in Macedonia. The peace deal had averted a civil war from breaking out in Macedonia. He was oriented towards the NATO and the European Union and was looking forward the Macedonian membership in the European Union and NATO. "He was a man of vision" - said Sam Vaknin, Ph.D. The legacy of Boris Trajkovski that is emerging has two aspects: one, as the populist president who defended Macedonia; and two, as the beacon of human rights and inter-ethnic understanding who lit the way for Macedonia's entry into the European Union. These views are respectively those of the Macedonian people and the international community. Boris Trajkovski died in a terrible plane crash on February 26th 2004, going on an International Investment (Economic) Conference in Mostar, Bosnia & Herzegovina. The US-made aircraft carrying Trajkovski and his associates, left the Petrovec airport in Macedonia at 6:48 AM on February 26th 2004. The aircraft that had to take the President Boris Trajkovski to an international investment conference in Mostar, Bosnia Herzegovina, flied on a line through Skopje-Albania-Serbia Montenegro-Bosnia, when suddenly disappeared from the radar screens as was approaching the city (Mostar). In 8:01 the aerial control of SFOR looses the plane from the radar in the Stolac area, 30 km southern of Mostar. Bosnian officials have said that the plane crashed into Bosnian mountains in thick fog and confirmed that the executive jet had disappeared from radar screens about 8:01 AM. 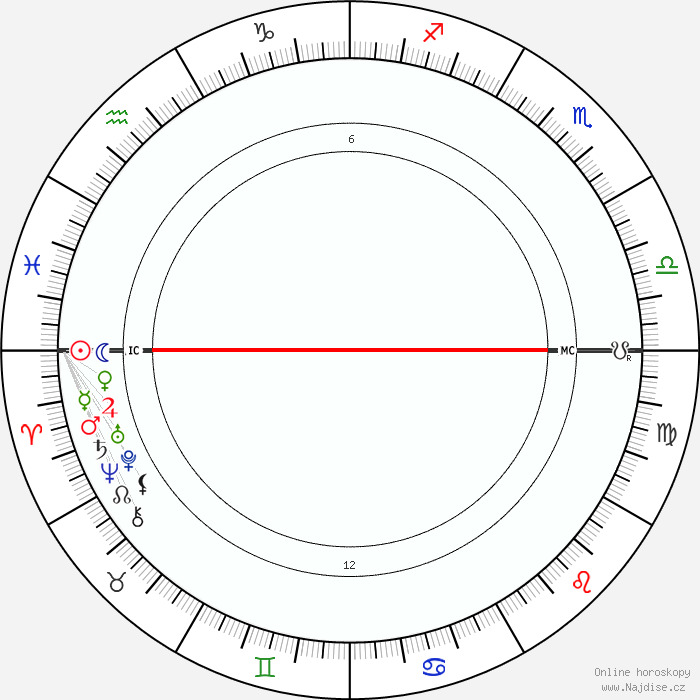 The crash was located the next day, on February 27th, on the point 524 in the are of the Husković village, 15 away from Mostar in Bosnia & Herzegovina. The Macedonian delegation was supposed to take part in an investment conference, the same day. The officials have confirmed that there were no survivors, all the 7 passengers including the President and the 2 pilots have died: Boris Trajkovski (the President of Macedonia), Marko Markovski (pilot), Branko Ivanovski (copilot), Dimka Ilkova-Boshković (presidential advisor), Risto Blaževski (presidential advisor), Anita Krišan-Lozanovska (presidential advisor), Boris Velinov (presidential bodyguard), Ace Božinovski (presidential bodyguard) and Mile Krstevski (presidential advisor). The death of the President of Macedonia shocked the European and World-Wide public. Macedonia's Prime Minister Branko Crvenkovski criticized NATO's Stabilization Force in Bosnia and Herzegovina (SFOR) for making some communication faults during the investigation of the plane crash that claimed the life of President Boris Trajkovski on February 26th. 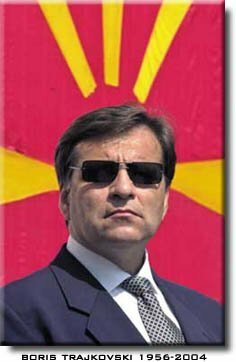 FEBRUARY 26th 2004: It is a tragic and sad day for Macedonia and the Macedonian people. May we all take this time to pray for the late President Boris Trajkovski and his family. May God Rest His Soul! At Thursday's extraordinary session, the Macedonian Government passed a decision that the flags at state institutions be lowered to half-mast and declared a three-day mourning, starting from Friday, February 27th. and on the municipal building in Strumica, where he was born"
"The Government concluded that the Republic of Macedonia has suffered a huge loss, but that all institutions function in a normal manner, without bringing into question the security and stability of the state", Government Spokesman Sašo Čolakovski stated. All the streets in the cities throughout Macedonia are filled with flags to half-mast. The people pay last respect to the President Trajkovski in front of the Assembly in the center of Skopje and in the local churches. 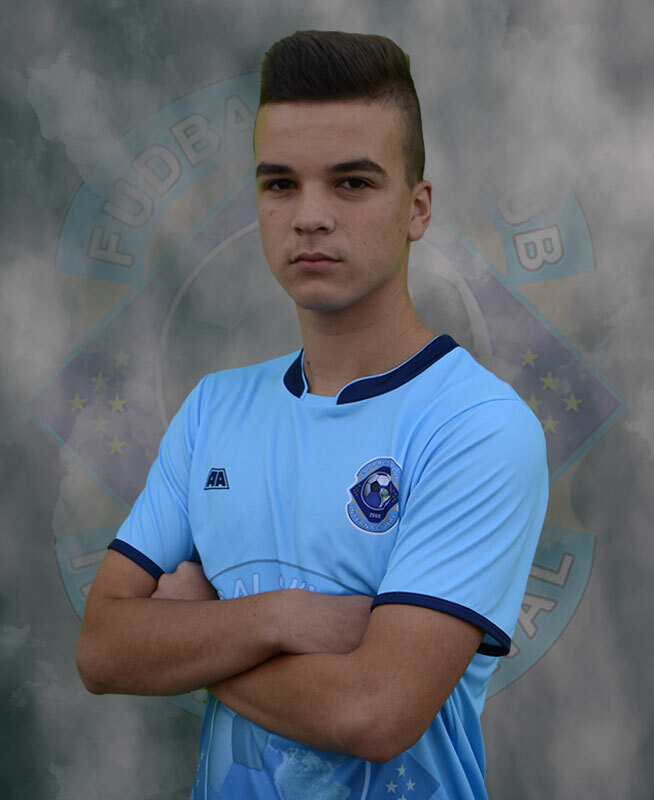 All sport, cultural and other manifestations were being cancelled, due to the tragic death of the President Trajkovski. An early reaction came from Dublin, where Irish Prime Minister Bertie Ahern was meeting a visiting Macedonian government delegation that was presenting an official application to join the European Union. The prime minister's office said Thursday a presentation ceremony for the EU application had been canceled because of the "tragic news that President Boris Trajkovski has died in a plane crash over Bosnia." Ahern also offered his "deep sympathy" to Macedonian Prime Minister Branko Crvenkovski. Bosnian President Dragan Čović told the Mostar conference that Boris Trajkovski was "irreplaceable," AP reported. "Today we lost a friend ... our thoughts are with the families of the victims," Čović said as the gathering of about 2,000 participants observed a minute of silence. In Brussels, NATO Secretary-General Jaap de Hoop Scheffer praised Trajkovski, saying he had "demonstrated great leadership to preserve the unity of his country when it was under threat," AP said. Reports of the 47-year-old president's death also echoed through the European Commission in Brussels. And European Commission chief Romano Prodi said "it was a very sad day for Macedonia that loses a wise and balanced leader. A very sad day for the Balkan region for whose integration he had spent so much effort. And a very sad day for Europe that loses a friend and a supporter of the values of tolerance on which our union is based." 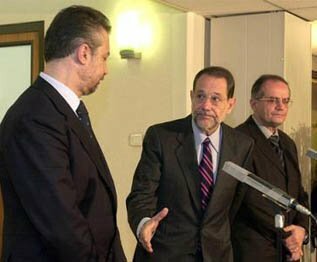 EU's international policy chief Javier Solana called Boris Trajkovski a "man of passion" and said it was a very tragic day for Macedonia, for all the people of that country but also for many people in Europe. "President Trajkovski was a great man, a man of passion, a man who moved his country forward, not only the reforms but also to get it as close as possible to Europe," Solana said in a statement. "I was his friend. I was with him in very difficult moments. It is going to be very difficult for the people of Macedonia to fill that gap," he said. express condolences for the death of the president"
British Prime Minister Tony Blair, Finnish President Tarja Hallonen and other European leaders sent their condolences to the Macedonian people and the government. The top U.N. official in Kosovo, Harri Holkeri, expressed his deep shock and sorrow, AP said. "The news of the death of the president hit me hard," said German Foreign Minister Joschka Fischer. Throughout the volatile Balkans, leaders praised Trajkovski for helping to unite his ethnically divided country following the bloody breakup of the former Yugoslavia in the 1990s. Croatian President Stipe Mesić said, Trajkovski's reported death was a "blow to the whole region, not only for Macedonia". "It was his authority that made it possible for the situation to calm down, to come back to normal, so that political solutions could be found," AP quoted Mesić as saying. "Macedonia won't have an easy time, and it won't be easy to find a replacement for Trajkovski." The foreign minister of Serbia-Montenegro, Goran Svilanović, said Trajkovski made a huge contribution to the stability of the entire Balkans. Bulgarian President Georgi Prvanov was among the first statesmen to express condolences over the death of his Macedonian counterpart. "Macedonia has lost its president, and it also lost a man who was a pure reflection of unity of a state, a man who worked hard till his last day on stabilization and development of his country, a man fully committed to bringing his country closer to Europe," Bulgarian president said. Bulgarian President underscored that Macedonian President has believed that Balkans nations could live in peace and mutual understanding and help each other. "Led by such commitment, he set out for Mostar today, and he died on this road." The former Bulgarian president Petar Stojanov and the former prime minister Ivan Kostov have already expressed condolences to Trajkovski’s family and to the people of Macedonia. George W. Bush: Laura and I are saddened by the death of President Boris Trajkovski of Macedonia - a distinguished leader and a great friend of the United States. On behalf of the American people, I extend condolences to President Trajkovski's family and to the people of Macedonia. President Trajkovski showed extraordinary courage in leading his country from the brink of civil conflict to peace by signing the Ohrid Framework Agreement. The United States strongly supports President Trajkovski's vision of a multi-ethnic, democratic Macedonia, at peace with itself and its neighbors, and on the path to full membership in the Trans-Atlantic community. Zhang Qiyue said the Chinese government was in "great shock" and "deep sorrow" at the news of the Macedonian president's death, and President Hu had sent a condolence message to Macedonian Assembly President Ljupčo Jordanovski, who has assumed the interim presidency. Meanwhile, on Friday noon, Chinese State Councilor Tang Jiaxuan went to the Macedonian Embassy in Beijing, observed a one-minute silence in honor of Trajkovski and wrote his words of condolence. Trajkovski was a close friend of the Chinese people, said Zhang, adding that when the China-Macedonia ties were at a difficult stage, it was Trajkovski that firmly abided by the "one-China" policy on the Taiwan issue. When the two countries relations were normalized, Trajkovski visited China in 2002 to improve ties. Zhang said the Chinese government and people spoke highly of Trajkovski's contribution to China-Macedonia relations, and appreciated his support for China's reunification. She expressed the hope to further develop the China-Macedonia relations on the basis of mutual respect, equality and mutual benefit. Since the coffin with the remains of the Macedonian President Boris Trajkovski was brought from Sarajevo airport with an U.S. Aircraft on March 3rd 2004, it was taken to the Hall of the Assembly of the Republic. 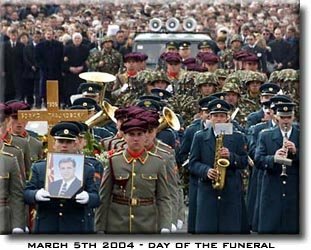 On March 5th 2004, at 11:55 AM, the coffin was put on a vehicle in front of the Assembly, which passed through the Dimitrija Čupovski street, 11 Oktomvri, Kočo Racin & Krste Petkov-Misirkov boulevard, Cvetan Dimov street Hristijan Todorovski-Karpoš, Bosna i Hercegovina, Aleksandar Urdarevski and Boca Ivanova street which ends at the Gradski Grobišta Butel (Butel City Cemetery), as the Arbored Walk of the Greats. The coffin with the remains of the President Boris Trajkovski, was followed by the National Guard as well as Army Orchestra then his family and relatives, representatives of the Government and General Headquarters of the Army and behind them many citizens wishing to pay last respect to the President. Over 4,000 people took part in the preparations for Boris Trajkovski's funeral. More than 60 high-state delegations were seen on the funeral ceremony, which looked similar to the funeral of Josip Broz.